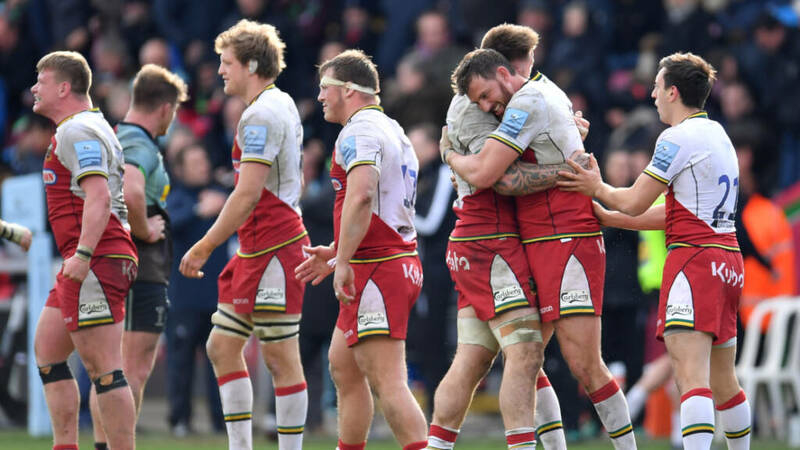 Saints back-rower Harrison was named skipper for this crucial clash in London and led from the front with a tireless display that thwarted Harlequins at every turn. Harrison led his side’s tackle count by some distance with 19, also leading the carry count with 17 and plundering 43 hard-won metres through the pack. Mitchell’s try may have been the crucial moment and Ahsee Tuala’s opener was extremely well worked, but Jack Clifford’s score at the opening to the second half was the best of the bunch. The visitors led 13-6 at the break but Harlequins were level eight minutes into the second half after wing Cadan Murley sped down the left before coming back inside to Clifford, who rode the last tackle to stride over the line. After 79 minutes of intense and competitive action this crucial match all came down to the last minute and two moments of brilliance from Northampton replacements. Speedster Mitchell caught Harlequins cold as he found a gap down the right and dummied his way over the line, with Grayson displaying awesome nerves to land the all-important kick. After the win, Northampton director of rugby Chris Boyd commented: “We got some good territory for the try, Jimmy Grayson made a great catch and then Mitch (Alex Mitchell) snuck around the corner and left it for James Grayson to put the two on and sneak the win. “James has got plenty so he needed to back it up because the boys would have given him some stick if he hadn’t! Quins director of rugby Paul Gustard commented: “From 10 minutes to 40 minutes our game management wasn’t good enough. We gave them field position, we lost field position, we lost aerial contests and we gave them points. “But in the second half we were much better, we defended exceptionally well, our set piece was good.